At The Door we are always on the look out for people who want to give an hour or two each week to help a young person or parent who needs someone to talk to. Our award winning Mentoring Servi ce works with around 100 people each year, providing s ‘professional friendship’ to help them vocalise their needs, develop an action plan, and meet their own goals. 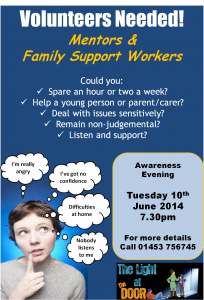 To find out more, why not come along to our Awareness Evening on 10th June, or email mentoring@thedoor.org.uk for an application form.